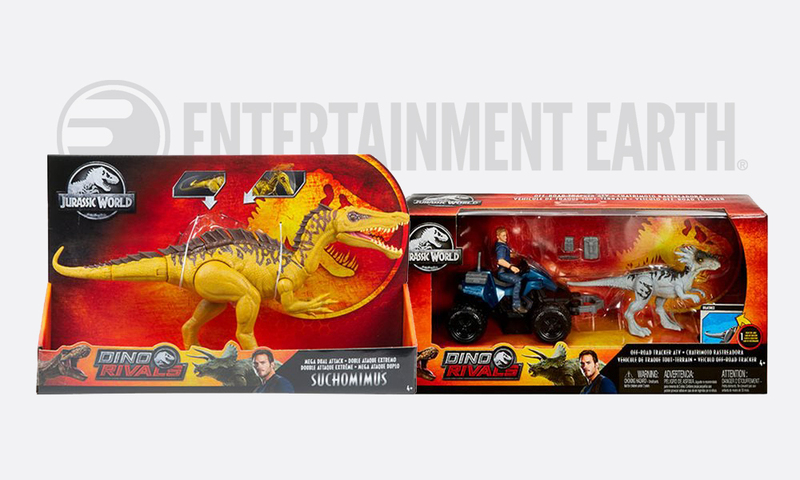 Excellent news for Mattel Jurassic collectors who are still trying to track down some of the new Dino Rivals figures released in select stores last month: Entertainment Earth is now shipping case packs for Dual Attack, Mega Dual Attack, Savage Strike and Story Pack assortments! The Mega Dual Attack and Story Pack figures are still rather elusive here in the US, only appearing in Meijer/Fred Meyer grocery stores. Now that they’re readily available on Entertainment Earth, many collectors should be closing out their Dino Rivals Wave 1 checklist. Click on the links below to go to the product page for each assortment—note that they may go temporarily go in and out of stock due to demand. Hunt quickly! As noted in our previous preorder post, these figures will ship in their original case packs (the original shipping box of figures that Mattel ships directly to departments stores and websites like Entertainment Earth). Stores will then open this box and put the items inside on the shelf, whereas Entertainment Earth actually ships the box directly to the customer within another shipping box. This means the toy packaging inside will be in about as mint condition as it can get for the discerning in-package collector.